The former Ford Sales and Service building that served as the headquarters of Ford Motor Co., located at 15000 Woodward Ave. in Highland Park, has been listed for sale. The nearby factory, called the Highland Park Ford Plant, was where the world’s first assembly line was introduced, and subsequently, the $5-a-day wage. 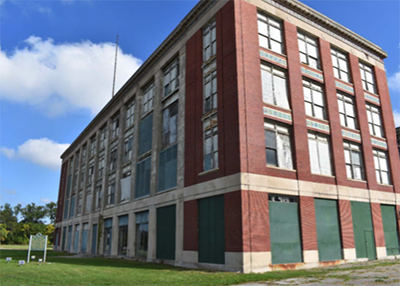 The historic, stone-and-brick sales and service building, located along Woodward just north of Oakland Avenue, is where Henry Ford oversaw the mass production of the Model T. The plant and ancillary structures were designed by renowned architect Albert Kahn. The plant opened in 1910, though the Model T was designed and originally built starting in 1908 at the Ford Piquette Avenue Plant in the Milwaukee Junction area of Detroit (which today is a museum and education center). More than 15 million Model Ts were built before production ended in 1927. Plante Moran REIA is marketing the property on behalf of the Woodward Avenue Action Association, which had acquired the structure through a grant a few years ago with the intention of preserving it, says Martin J. West, president of Plante Moran REIA. The association wanted to turn the space into an automotive heritage cultural center, but the idea was abandoned, according to Tim Ross, CEO of Ross Mortgage and acting chairman of the association. Now, the Woodward Avenue Action Association is looking for a buyer that will use the space to improve work-life balance, transit, or education in the area. The marketing brochure suggests that the building’s ground floor can be used as an office and museum space, with office space on the upper three floors. An adjoining building could be used as classroom, training, or event space. Potential tenants include businesses, a museum, retail, and educational activities. For more information, contact Douglas T. Smith, vice president at Plante Moran REIA, at doug.smith@plantemoran.com or call 248-603-5356.